Awen is a Welsh word often translated as “inspiration”. However, in its fullness it has a much deeper meaning, an irradiation of the soul from paradisal origins. In the context of the Celtic folk-soul it casts the paradisal pattern by which the people and the land were harmonised. Through the aligned symbolism of the goddess, the sacred king and the stars, a compelling picture is built of a thriving mystery tradition. 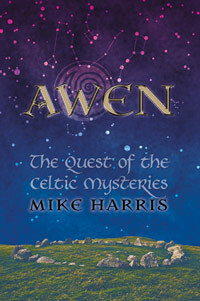 In AWEN, The Quest of the Celtic Mysteries, Mike Harris puts would-be seekers on a bridge to the ancient world where they can reconnect with the Brythonic Celts, their constellations and legends, and most of all – their sacred land. A poet himself, Mike Harris is keenly attuned the bardic traditions of Taliesin, the mythical poethos of the writers of the Mabinogion, and the mnemonic texts of the pre-Augustine Brythons. His work is well researched, neatly collated, and presented in an inspiring style that will appeal to historians, mythographers, anthropologists, comparative religionists, as well as those especially enamoured by the spiritual realms and their secret progeny. In a field where so many authors pander to cliché, fantasy, parody and populism, Harris gives us his world of the Keltoi, full of scholarly substance and panache. His great gift is being able to transcribe written words from old parchments to an animated chorale of living landscapes in a way that allows for the physical internalization that the bards intended. He is a spiritual cartographer of sorts, lifting dead language from the page and retracing its magical glyphs and sigils across the rugged vistas of the Mabinogi. AWEN, The Quest of the Celtic Mysteries is available from various retail outlets such as Amazon, or direct from the Skylight Press website. This entry was posted in Esoteric, Literature, New authors, New books, Recommended reads, Reviews and tagged Anthropology, British History, Brythonic History, Celtic, celtic history, Celtic Mythology, Celts, Dion Fortune, esoteric, folklore, Gereth Knight, Golden Dawn, Mabigonion, Magic, Mike Harris, Myth, mythology, Occult, ritual, Spiritual, spirituality, Welsh History, Welsh Literature, Western Mysteries, Western Mystery Tradition. Bookmark the permalink.